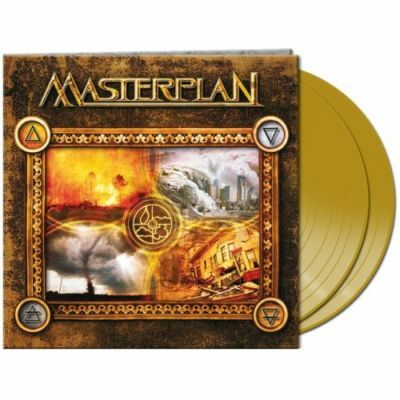 MASTERPLAN - MASTERPLAN AZTEC GOLDEN VINYL (2LP) | Online Shop | Wizard LTD. Album: "MASTERPLAN AZTEC GOLDEN VINYL (2LP)"
Sometimes even human beings can learn to fly. Renounced from difficult times in the past which every one of them definitely went through, Jorn Lande from Frederikstad/Norway (vocals, formerly Ark), Roland Grapow from Hamburg/Germany (guitars, formerly Helloween) and Uli Kusch from Aachen/Germany (drums, formerly Helloween) have found together with Jan S. Eckert (bass, Iron Savior) and Axel Mackenrott (keyboards), to reach for the stars. Masterplan produced the material for their impending debut offering in spring 2002 at the Crazy Cat Studio in Hamburg, with the help of Producer Andy Sneap (Machine Head, Testament, among others). The mixing was done by Mikko Kamilla (Stratovarius, Edguy) at Finnvox Studios in Helsinki. Mika Jussila (Edguy, Stratovarius) was responsible for the mastering, which was also done at Finnvox Studios. The result is a versatile album that sounds like a unified whole on the interface of tradition and modern music, a recording with solo highlights and homogeneous songwriting throughout. The LP will be released as a limited edition in gold and with two bonus tracks.